That's Beijing – February 2019 Issue Out Now! China is a land of stark juxtaposition. From its hutongs and street carts selling jianbing to its skyscrapers and staffless stores, it seems as though the country is on a bumpy rickshaw to the past and a high-speed bullet train blazing toward the future all at the same time. But this intersection of history and the modern world did not happen as long ago as it may seem – and there are people still alive to tell the tale of a time long before WeChat wallets and shared bikes (if you can believe it). Which brings me to this month’s cover story: A photoblog of China’s not-so-distant past. I first heard about Cameron Hack’s project Humans of China via a Facebook message: “My name is Cameron Hack. I am based in Beijing and my hobby is to find extraordinary stories from ordinary people." The British photographer spends his spare time traveling to rural regions of China, listening to individuals who have lived through everything from the tradition of foot-binding to the terrors of war. You can read a collection of these fascinating stories shared by Hack in our February issue and follow his project for more. And Edoardo Donati Fogliazza tries out the new Mexican joint Moji. That's Beijing – March 2019 Issue Out Now! The March 2019 issue of That's Beijing is out now – paper-and-ink form citywide and also in digital-pdf form. That's Beijing – January 2019 Issue Out Now! 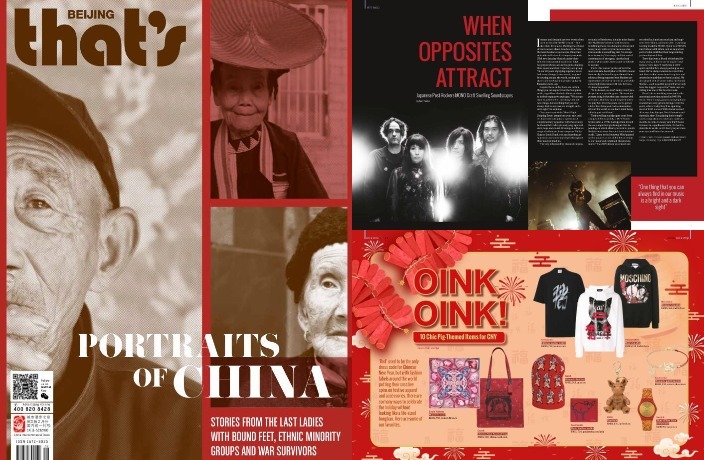 The January 2019 issue of That's Beijing is out now – paper-and-ink form citywide and also in digital-pdf form. Finally a horoscope that understands your life in Beijing. That's Beijing – February 2018 Issue Out Now! The February 2018 issue of That's Beijing is out now – paper-and-ink form citywide and also in digital-pdf form. The airport is expected to open its doors in late 2019.